Apparently that is to be no more. We no longer have a “War on Terror” seeking out those who have or are trying to attack us, but we have “Overseas Contingency Operations,” the administration’s new term. And the initial objective in Afghanistan is apparently no longer to defeat the Taliban and secure peace for a troubled nation, and reducing the risk of another despicable attack from being planned there. Victory over our enemies is no longer the aim, as Obama said last month, “I’m always worried about using the word ‘victory,’ because, you know, it invokes this notion of Emperor Hirohito coming down and signing a surrender to MacArthur.” Aside from the historical ignorance displayed by the comment, most troublesome is his admission that we aren’t there to win. If we’re not there to win, what on earth are we doing there? This was initiated in April with legislation establishing 9/11 as a National Day of Service. They did add the words “And Remembrance” to the bill, but that was undoubtedly an afterthought. I’m sure not many of us gave much heed to the declaration at the time, but a recent conference call between the White House and over sixty radical leftist groups clarified the intent behind the declaration. Among those on the August 11 conference call were Color of Change, ACORN, Apollo Alliance, Community Action Partnership, Friends of the Earth, Mobilize.org, and the RainbowPUSH Coalition. According to a source that participated on the call, as quoted in the American Spectator, “They [the Obama administration] think it needs to be taken back from the right. They’re taking that day and they’re breaking it because it gives Republicans an advantage. 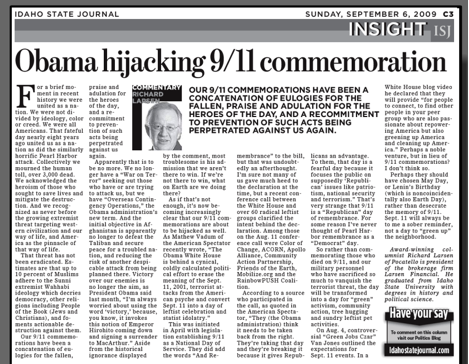 To them, that day is a fearful day because it focuses the public on supposedly ‘Republican’ issues like patriotism, national security, and terrorism.” That’s very strange that 9/11 is a “Republican” day of remembrance. For some reason I’ve never thought of Pearl Harbor remembrance as a “Democrat” day. So rather than commemorating those who died on that day, and our military personnel who have sacrificed so much to vanquish the terrorist threat, the day will be transformed into a day for “green” activism, community action, tree hugging, and sundry leftist pet activities. A week earlier on Aug. 4, controversial “Green Jobs Csar” Van Jones outlined the expectations for Sept. 11 events. In a White House blog video he declared that they will provide, “for people to connect, to find other people in your peer group who are also passionate about repowering America but also greening up America and cleaning up America.” Perhaps a noble venture, but in lieu of 9/11 commemorations? I don’t think so. Perhaps they should have chosen May Day, or Lenin’s Birthday (which is noncoincidentally also Earth Day), rather than desicrate the memory of 9/11. September 11 will always be to me a sober reminder, not a day to “green up” the neighborhood.